Visual astronomy is the practice of pushing our built in optical detectors to the limits of performance. Our eyes are surprisingly good optical instruments, and until the advent of film about a century ago were the only means we had of observing the universe. Even now, in the age of sensitive electronic detectors there are those who appreciate the view of the heavens through our own eyes. This does not keep some from trying other ways to improve the view. Night vision technology, devices pioneered by the military that amplify the available light, offer intriguing possibilities. Available in compact packages these amplifier image tubes have been incorporated into an eyepiece sized package that can replace a standard eyepiece and offer an amplified image. The image tube operates by charging a grid to a high voltage inside a small vacuum tube. Incoming light (photons) strike this grid and create a shower of electrons that continue onwards to strike a phosphor screen at the rear of the tube. A single photon can create a shower of hundreds of electrons, a very large signal gain. The phosphor screen glows where struck by photons, creating a image of the amplified signal. A bright image is seen on the screen of the object, hundreds of times brighter than the original. The image is green, as result of the phosphor, this amplification is a monochromatic process. There is some noise in the image, random “sparkles” called scintillation that result when electrons leave the charged grid in a random fashion. The images shown here are taken with the Collins I3 eyepiece or I3piece. The device is a very nicely built unit that is about the same size as a modern high quality eyepiece. Actually it is much smaller than some of the large designer eyepieces seen on some telescopes. An internal battery means there are no cables resulting in a neat package. The intensifier has a standard 1.25″ or 2″ nose piece threaded to accept standard astronomy filters. The image intensifier is not a panacea, there are some objects where the intensifier works well, and others where it does not perform. Globular clusters and planetary nebulae are quite dramatically represented in the intensified view. It is faint, low surface brightness objects like galaxies and extended nebulae that are often better appreciated with a normal eyepiece. Switching back and forth is generally a poor idea as using the intensifier decreases dark adaptation. During personal observations of galaxy views in two large telescopes side by side, I noted more detail in the un-amplified images compared to those using the intensifier, particularly where subtle detail was concerned. I have had opportunity to observe the same galaxy in my 18″ f/4.5 followed by the view in a 24″ with the intensifier. The images in the intensifier were much brighter, but the contrast range seem compressed, such that HII regions and similar low contrast details disappeared. One place where the value of the intensifier is undeniable is in public outreach. 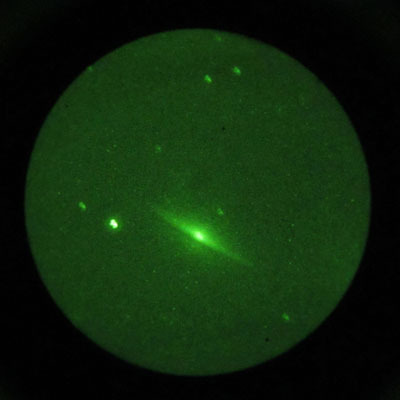 The live views of bright galaxies show far more detail to the inexperienced observer that they would otherwise have missed in the eyepiece view. 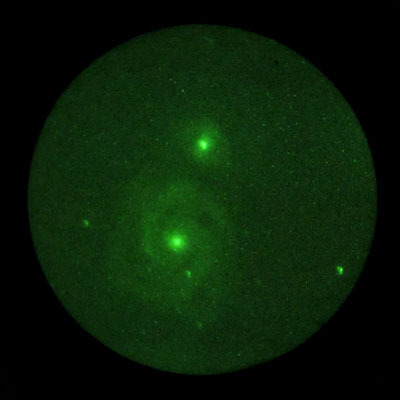 A spiral galaxy is clearly a spiral galaxy, even to a first time observer. In addition the intensifier can be used to provide views of faint objects under less that ideal conditions. Addition of a narrowband filter can increase the signal to noise and allow viewing of emission nebulae even with substantial light pollution from natural (e.g. the Moon) or artificial sources. Unfortunately the Collins intensified eyepieces are no longer available from the manufacturer, though the website still appears functional. There is an equivalent product from BIPH which uses the same technology. At nearly four thousand dollars these devices are not for everyone. they can be used to good effect under the right conditions.